BSNL - the only PAN India 3G Service Provider and the most trusted Telecom Company in India welcomes everyone to join their family through MNP (Mobile Number Portability). MNP lets mobile subscribers to shift / change their mobile service provider without changing their current mobile number. 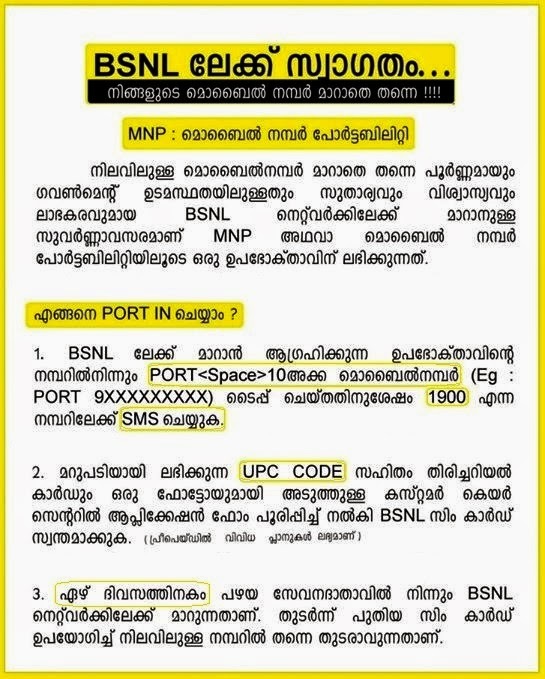 MNP reports revealed that, BSNL has achieved the maximum number of New Customers through MNP in Kerala Telecom Circle. BSNL is the only operator in India who provides PAN India 3G service and that too at the lowest and economical tariff. We may port our existing Prepaid or Postpaid Mobile Number to BSNL. Upon porting, we may select any of the available Prepaid Plans or Postpaid Mobile Plans of our choice. The mobile number should be used at least 90 days in the current operator before porting. Customer will get their Unique Porting Code (UPC) in the reply SMS from 1901. Now, visit your nearest BSNL Customer Care with your UPC + Passport size photo + Identity proof and Address proof and submit the application form for porting in your number to BSNL. Get your New SIM card from BSNL Customer Care / Retailer on submitting your application. You will recieve Tele-Verification Call from BSNL Call Center agents within a couple of days and your Identity, Address, Date of Birth etc. will be verified. Your application will be processed and the number will be ported in to the BSNL Network within 7 working days. You will also receive SMS notifications from BSNL regarding the Date and approximate Time of porting. After successful porting, insert your New BSNL SIM card in your handset and dial just dial 123 and complete the Port-In process. NB: While porting our Postpaid Number, ensure that all our postpaid mobile bills are paid and no outstanding dues are existing in our number. After successful port-in, we should pay the bill raised by the previous operator for the period of porting (7 days), failing to which may cause barring to our ported number. Since Full MNP is available, customers may retain their existing number while shifting between states or telecom circles. Dear readers, Kerala circle is the most revenue generating telecom circle in India for BSNL and they have got a Market share of 29% as per the latest subscriber data report by TRAI. What may be the reasons for this outstanding performance of Kerala Circle? Only one reason,Keralites are more educated and literate than others.Ask to any Bengali workers here about a telecom company in India they know,they will only say AIRTEL they never heard of BSNL!!! I know that BSNL INDIA is a standard telecom company in INDIA. Because it maintain all the tariff at equal rates. Internet is so much cheap is about 2p/10kb. Other networks like airtel,Aircel, vodafone are giving their net as 10p/10kb. Thank you BSNL INDIA for giving in low rates. Also one minus point is there I.e., pls give default validity about 10years.